Bhavan❜s Tripura Teacher Training College (BTTTC) is a co-educational B.Ed college established under the tutelage of Bharatiya Vidya Bhavan in 2015. It is located at Anandanagar which is 9 Km away from Agartala city and nearby Jogendranagar Railway station. The college is set up by Bharatiya Vidya Bhavan, Agartala Kendra with the active support of Govt. of Tripura and Govt. of India with an objective of offering teacher education. BTTTC is recognized by NCTE and affiliated to Tripura University (A Central University). It has started its journey from the academic session 2015-16 with an intake of 100. The institution aims at empowering the student teachers with the professional, moral and social competencies to compete with the challenging world. The college is committed to develop a complete teacher. Our vision is to enrich the quality of school teaching by producing excellent teachers in the society. To educate the youths who have an aspiration to pursue the job of teaching in future. To enhance the quality of Secondary Education of the state providing effectively trained teachers. To serve the society in a more effective and meaningful way through community involvement. To develop the college into a resource centre that could help the teachers in performing their job in the best way. We do not have any private agency or correspondence office inside or outside the state Tripura. If any one is misted by false promise of admission made by any private agency or office or any individuals, college authority will not be responsible for the same. K.M. Munshi was born on 30 December 1887 in the town of Bharuch in Gujrat, and educated in Vadodara (Baroda), Were he excelled in academics. One of his teachers at Baroda College was Sri Aurobindo Ghosh who had profound impresssion on him. Munshi was also gratly influentced by Mahatma Gandhi, Sardar Patel, Bhulabhai Desai, and Mohammed Ali Jinnah. After acquiring his degree in Law from the University of Bombay, he enrolled himself as an advocate in 1913, and soon becoame a member of the Bar. Munshi began practicing at the Boambay High Court. His fame spread as a good and successful lawyer spread and he began getting cases from all over India. About this time his first novel was being serialised in a Gujrati weekly. During World War I, Munshi was influenced by the Home Rule Movement. In 1912 - 13, he took part in the activites of the Social Reform Association and champined the cause of widow remarriage. He led by example and married Lilavati Sheth, a widow,in 1926. He also founded the Children's Home for delinquent children at Chembur, Bombay in 1939. Under Sri Aurobindo's influence, Munshi was attracted to armed rebellion against the British. He even learnt to make bombs, but when he moved to Bombay in 1915, he drifted towards the Home Rule Movement, and was later elected member of the Subjects Committee of the Indian National Congress in 1917. When Sardar Patel was organising the Bordoli Satyagraha, Munshi lent his suport, and when Gandhi announced the Salt Satyagraha, he joined the movement along with his wife. He started the movement for a parliamentary wing of the Congress, and later became Secretary of the Congress Parliamentary Board in 1938. The same year he founded the well-known Bharatiya Vidya Bhavan and Institute of Agriculture at Anand, Gujarat. Munshi was an active participant in the Indian Independence Movement ever since the advent of Mahatma Gandhi. He joined the Swraj Party but returned to the Indian National Congress on Gandhiji's behest with the launch of the Salt Satyagraha in 1930. He was arrested several times, including during the Quit India Movement of 1942. A great admirer of Sardar Vallabhbhai Patel, Munshi served in the Central Legislative Assembly in the 1930s. After the indipendence of India, Munshi was appointed diplomatic envoy and trade agent (Agent-General) to the princely state of Hyderabad, where he served until its accession to India in 1948. Munshi was on the ad hoc Flag Committee that selected the flag of India in August 1947, and on the committee which drafted the Constitution of India under the chairmanship of B.R. Ambedkar. He and Purushottam Das Tandon were among those who strongly opposed propagation and conversion in the constituent assembley. He was also the main driving force behind the renovation of the historically important Somnath Temple by the Government of India just afte Inddependence. 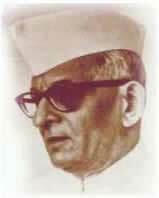 Munshi served as the Government of Uttar Pradesh from 1952 to 1957. In 1959, Munshi separated from the Nehru-dominated (socialist) Congress Party and started the Akhand Hindustan Movement. He believed in a strong opposition, so along with Chakravarti Rajagopalachari he founded the Swatantra Party, which was right-wing in its politics, pro-business, pro-free market economy and private property rights. The party enjoyed limited success and eventually died out. Later, Munshi joined the Jan Sangh. Being a prolific writer and a conscientious journalist, Munshi started a Gujarati monthly called Bhargava. He was joint-editor of Young Inda and in 1954, started the Bhavan's Journal which is published by the Bharatiya Vidya Bhavan to this day. Munshi was President of the Sanskrit Viswa Parisad, the Gujarati Sahitya Parishat, and the Hindi Sahitya Sammelan. Apart from founding Bharatiya Vidya Bhavan, Munshi was instrumental in the establishemtn of Bhavan's College, Hansraj Morarji Public School, Rajhans Vidyalaya, Rajhans Balvatika and Panchgani Hindu Shcool (1924). He was elected Fellow of the University of Bombay, where he was responsible for giving adequate representaion to regional languages. He was also instumental in starting the department of Chemical Technology. Besides being a politician and educator, Munshi was also an environmentalist. He initiated the Vanamohatsav in 1950, when he was Union Minister of Food and Agriculture, to increase area under forest cover. Since then Van Mahotsav a week long festival of tree plantation is organised every year in the month of July all across the country and lakhs of trees are planted. Bhavans Tripura Teacher Training College. 2016-17 © All Rights Reserved. | Design & Hosted By: The Computer Point.